I enjoy being outdoors with my family. We try to use every free weekend to get out of the city and spend our time surrounded by nature. There is still no favorite spot for us, but we actually rather change our destination every time. Sometimes we go camping (which my boys simply adore), and sometimes we rent a bungalow or a cottage somewhere in the country or in the mountains. You can easily assume that I am responsible for feeding these three hungry men while out in the "wild". This usually takes a lot of planning ahead since most of the time there are no supermarkets to hop in and buy the things you have forgotten. It means that I have to take a lot of things with me, not only food, but also the appliances to prepare it well enough. The campfire serves my boys only for marshmallows, everything else is in my hands. I have therefore acquired everything I need in a portable version. But, since I do not like to use the camping gas stove I have only been missing a small electric cooker, and I have made myself a mission to find the best portable electric stove on the market. Further Reading: Pellet Stove Vs. Wood Stove: Which One Is Better? Why Buy A Portable Electric Stove? How To Choose The One That Fits Your Needs? 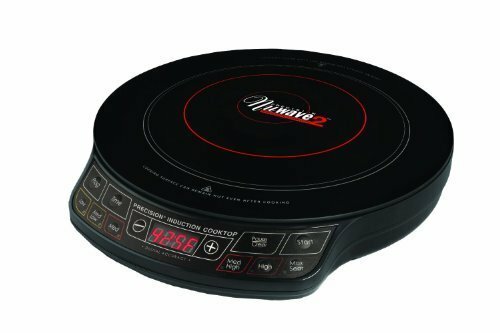 The induction technology cooking system heats a magnetic cooking vessel by magnetic induction, instead of by thermal conduction or an electrical heating element. Since the vessel is directly heated, increases in temperature are very rapid. Therefore, they heat up more quickly which saves your precious time. Also, you have a greater control of the temperature and save energy too. But, the downside is that you need to have the pots﻿﻿﻿ that work with the induction burners, and not all do. The induction-ready cookware is that made of steel, cast iron, cast aluminum enameled iron and steel, stainless steel with a magnetic bottom (recommended for best results), or flat-bottom pans/pots. I own a set of Walmart induction cookware, so it is not an issue for me, but you should consider the additional cost if you do not already own it. The cast iron portable stoves are, on the other hand, great for use with any kind of material - you can even use heat resistant glass or aluminum food containers to warm your food and serve it right away. First and foremost, you can always have a warm homemade meal wherever you are. In my family, we all appreciate this. I must admit that it has to do with my overpouring love for cooking, but I believe that every person prefers a warm meal to a cold sandwich. Also, you can use it as an additional cooktop when you prepare food for a large group of people, or when your stove is out of commission for cleaning or repairing purposes. A hot plate burner can be hooked up to a generator during a power outage, which is a great convenience. With a portable cooktop, if you have power, you have a fully functional stove, although smaller than the one you usually use. 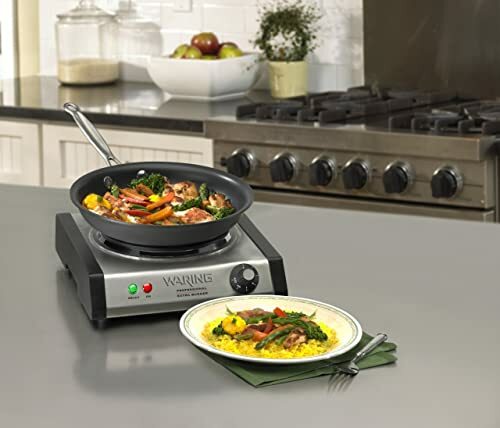 The induction stove heats up very quickly, therefore it is a great help when in a great hurry. Portable electric stoves can be plugged in outside next to you﻿﻿r grill and serve to cook the fresh barbecue sauce. It would be almost like having a fully functional kitchen outdoors. I am sure your neighbors would envy you. You can even take it with you on the road and use it in a camper or set up a temporary kitchen at a campsite or cabin. You can be creative and utilize portable electric stove burners as useful warming plates. I do that often when I have guests for dinner. Prepare your food ahead and then set the cooktop on low temperature, it will keep your soup or stew warm for hours, ready to be served to guests. They could also be great for students to use in their dorm rooms, and way safer than an indoor propane stove, a small gas burner, a butane hot plate or any other non-electric hot plate in general. Or you can take them into your hotel rooms (just check with the reception if you are allowed to do that first) and enjoy your favorite cup of tea or coffee whenever you like. All in all, with a bit of imagination and a lot of good organization, you can create masterful meals almost anywhere. This is a tough question for me to answer since your choice depends on your personal needs and possibilities but I will try to help you with the few things you should take into the consideration. Do you need it to be lightweight and easy to pack? Are you going to use it often and cook complicated dishes? Is a temperature range of importance to you? In that case, you should probably opt for the higher quality (and price). 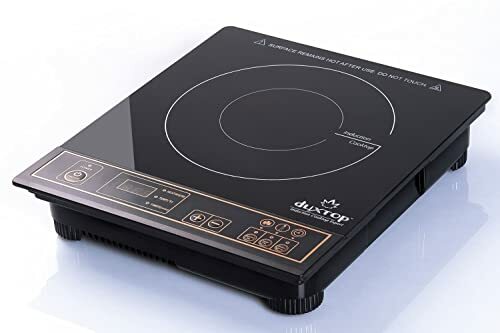 If it is going to serve you to occasionally warm up a meal or make yourself a cup of tea, quality is not that crucial and you can save yourself some money and buy some basic model from the range of cheap electric cooktops available. I have tried five different models, four portable induction stoves and one one cast iron burner countertop. As you can notice, I have given prime to induction technology since it fits my needs better. I will mostly cook with my boys around and since the surface of the induction cooktop stays cold to touch, it is a safer option when you use it near kids. I bought these five portable electric stoves, unpacked them and used them both indoors and outdoors. As usual, I have tried to discover all the pros and cons, so that you would not have to. These are my findings in the random order, the winner of the title "the best portable electric stove" will be announced at the end. First of all, I liked its attractive look and ergonomic design with the stylish curved digital control panel. I have used it as a warming plate during my relatives’ visit and they all complimented its modern look. During this time I have realized that I may sit back and enjoy with my family not having to check the timer or the temperature settings every minute since I could see the curved display from the distance. It is very ingenious. The built-in timer can be set from 1 to 180 minutes and you can also choose from 10 temperature settings ranging from 176°F to 536°F (80-280C) - this is easy to operate and gives you a great sense of control over cooking temperature and time. A great safety feature and a great plus for me is the overheat protection. I have read the instructions, that were very easy to understand and I found that there were five modes of use: hot pot, fry, BBQ, milk, water. I have not used them all though, but I boiled the water for the pasta and it took around two minutes to get the water to a full boil. Almost half the time it takes on my mini gas stove. The surface of this stove heats to the same temperature as the bottom of the pan. The internal fan will cool down the unit, but the surface will still be hot! I have used this one on an outdoor barbecue party at my mother’s house. I wanted to cook some sauce and tried to set a perfect temperature to simmer it choosing the best power level for it from 200-1800 watts range and the best temperature from 140 to 460 degrees Fahrenheit, but I could not. It was either boiling hard or not at all. I have eventually given up and used a portable gas burner. I have decided to give it another try tomorrow at the breakfast. Yet, frying some bacon in it also proved difficult. It seemed to heat beyond the set temperature and unevenly. I have ended up with some burnt pieces of the bacon in the middle of the pot. I guess that it can be used for some basic cooking, but if you desire some precision and control over temperature and time, I would not recommend this portable electric stove. I brought this one with me on a little weekend family get-away to the mountains. We went there with the camper and I was particularly happy that this time I would not have to use the indoor gas stove or indoor propane burner as they would heat up the little space inside quite quickly. The top surface is like “frosted” glass, rather textured, and this is great when I use it in my camper because the pan will not slide around even if it is not perfectly leveled. My first test included frying some bacon and eggs for my boys, and it went great until I wanted to flip the eggs. The electric mini stove stopped working immediately when I removed the pan and I had to push the start button to start it again. Imagine flipping pancakes, it would surely make anyone crazy. Be aware of the other issue as well, the 6.5 inches inner ring marked on the top is the actual size of the induction burner. Outer ring doesn't really mean anything at all. The manual states that you can use up to a 12-inch pan, but in that case, the pan will not heat evenly. I must add that it has the most precise temperature control, adjustable in 10-degree increases. 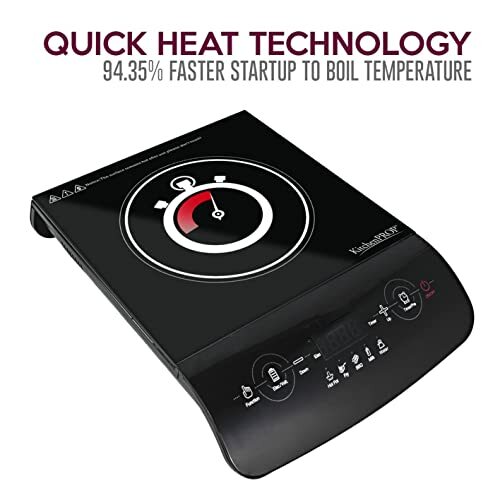 With a minimum temperature setting of 100°F and an upper limit of 575°F it also has a "Delay" function which allows you to choose the time it starts cooking and the time it automatically shuts off. It worked great for me; I have set up a soup and went hiking for few hours, and my whole family enjoyed it when we came back tired- it was ready and still warm. This is the second Secura electric small stove I have tried, and it is quite similar to Secura 9100MC already reviewed. The difference is in the number of temperature setting levels. This model has only ten levels of temperature while Secura 9100MC has fifteen levels to choose from. The problems are the same.This Secura’s induction hot plate would not hold the set temperature either. I have used my infrared thermometer and one minute it was 300 degrees, the next it was 400 degrees, and it kept fluctuating. There were also huge hot and cool spots that my infrared thermometer detected. I have used it though for soups and stews, and other dishes that are liquid, and they all worked out well enough. It was easy to operate and move around, so I found a great spot near my sink. I could fill it with water there and clean and cut veggies directly into it. Not having to go back and forth to the stove saved me a lot of time and effort. This one obviously differs from all the other portable induction stoves I have reviewed. I have used it in my home for a week or so, and I have come to realize that the cast iron burner is a great choice when I need a slow, low heat for a long time. It takes a lot of time to heat up. For example, it took me twelve minutes to boil the water for the pasta, and when I had put the pasta in and lowered the temperature, it took about five minutes to transfer from boiling to stirring. After the pasta was done, it took an incredible forty-five minutes for the burner to completely cool off. I would never bring it to the camper in the summertime! The design is good, except for the plastic edges that become very hot and could melt when you use an oversized pan. There are five levels of temperature to choose from, which gives you less control than the induction technology. It is also harder to clean if you spill something on it. On the other hand, the heat is distributed evenly, which seems to represent a problem for the induction stoves. It can also be bought as a two burner stove. First of all, I must admit that I prefer the induction burners to cast iron since they are more efficient and have better safety features. On the other hand, it is obvious that the induction technology has some universal faults and benefits. 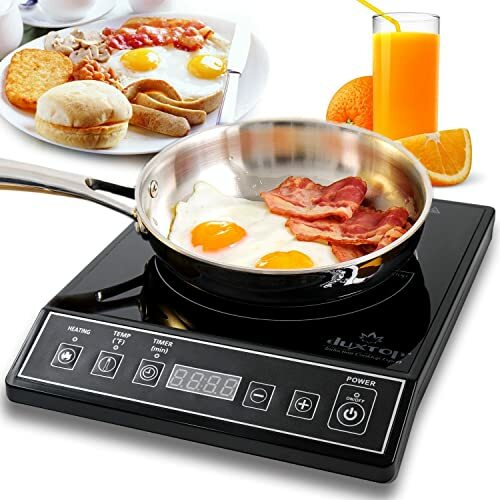 This makes the task of choosing the best induction hot plate a difficult one. However, the Multifunctional Induction Countertop by ﻿﻿KitchenPROP﻿﻿™ is my choice for the sake of a great design and the best heat conduction control. The induction technology is innovative but there is still a lot of space for further improvements. I am certainly going to use my Multifunctional Induction Countertop by KitchenPROP™ portable electric stove, and it will be my companion in many outdoor adventures, but I am going to hold on to my outdoor propane stove for now as well.